ustoms officers discovered four stowaways hidden in a container aboard the "OOCL Montreal" on July 20, 2017, in the port of Montreal. They were transported by ambulance to the Santa Cabrini Hospital where their condition subsequently stabilized. Two of them suffered from dehydration and difficulty of breathing. The four men in their thirties would come from Georgia. They had been in the container for at least a dozen days. The container was full of cars. The container ship had left Hamburg in the evening of July 10 and arrived at the Montreal Gateway wharf in the evening of July 18. The containers were unloaded one by one when the customs officers randomly inspected one of them around 7.15 a.m. The Royal Canadian Mounted Police (RCMP), the Canada Border Services Agency and the port authorities were investigating the case. 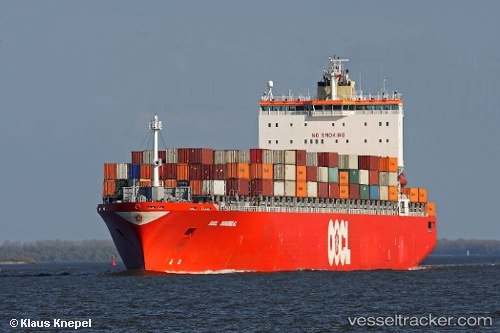 OOCL has announced the terminal change for the Hamburg port call on its Gateway Express 2 (GEX2) service.Last Vessel calling at Terminal Burchardkai (CTB):• Toronto Express, voyage 64W45/64E47, ETA Hamburg on October 31, 2015First Vessel calling at Terminal Altenwerder (CTA):• OOCL Montreal, voyage 70W46/70E48, ETA Hamburg on November 7, 2015The berth window at Hamburg will remain unchanged. HONG KONG's Orient Overseas Container Line (OOCL) has been fined EUR50,000 (US$69,000) in the accidental death of an executive in France 11 years ago, reports Reuters. OOCL was found guilty in a criminal court in Le Havre of involuntary manslaughter in the July 3, 2003 death of Courtenay Allan, following a long campaign by Allan's three sons, Ben, Hayden and Tristan Allan. "After 11 years of campaigning for justice, we are pleased that OOCL has finally been held responsible for our father's premature death," they said in a statement. Allan, 53, died after plunging six floors down an elevator shaft aboard the 4,400-TEU OOCL Montreal when the lift doors inexplicably opened without the elevator. Allen, head of OOCL's transatlanic trades, was attending a cocktail party while the ship was docked at Le Havre.